Indigestion is a painful condition that results after you finish a meal. It shares many common symptoms with heartburn, including a burning or painful sensation in your stomach. Indigestion also can make you feel uncomfortably full, which can sometimes lead to bloating or nausea. While indigestion does not necessarily indicate a more serious condition, you can avoid the causes of indigestion -- including greasy foods. Greasy foods contribute to indigestion because of their high fat content. When you take in fats, your stomach sends signals to your brain to slow stomach emptying. This is to prevent an excess amount of fats from being released into the bloodstream at one time, which can clog your circulatory system. Also, fats, such as those found in greasy foods, are digested more slowly because they must be broken down into smaller particles before they can enter the small intestine, where they are then fully broken down. This means that the fats may sit heavily in your stomach for some time, leading to indigestion. Greasy foods does not necessarily mean oily foods -- for example, olive oil that can be used for salad dressings can give salad an oily texture, yet is not necessarily bad for your stomach. However, greasy foods like pizza, French fries, hamburgers, popcorn or fried chicken all can be difficult for your body to break down. If you do eat these foods, do so in small serving sizes, which allows your stomach more time to break them down. If your indigestion is due to greasy foods, you may wish to take medications that help encourage stomach emptying, meaning the fats in your greasy food will move from your stomach to your intestine more quickly. You may first try antacids, which reduce the amount of acid in the stomach. 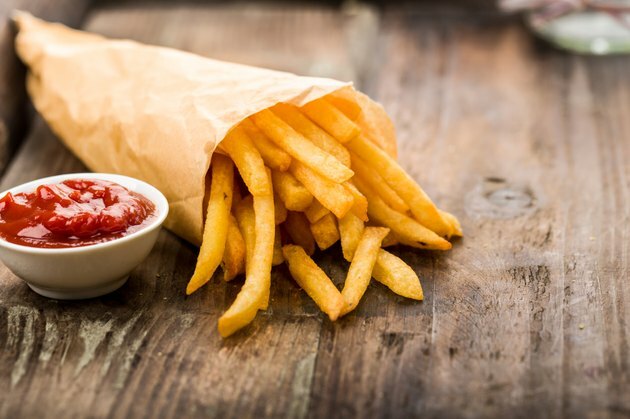 This is helpful because greasy foods can stimulate acid production in the stomach. A medication option is prokinetics, which speed stomach emptying. This medication requires a physician’s prescription, however. If your indigestion does not cease by refraining from eating greasy foods, you may need to seek medical attention. If you experience unexplained weight loss or your symptoms develop into more severe abdominal pain, you also may need to see your physician. Other symptoms that require immediate medical attention include jaw, chest or back pain, extreme sweating or anxiety. Go Ask Alice! Health Services at Columbia: Greasy Foods Lead to Acne and Gallbladder Problems?